Fall is my favorite time of year––summer hangs on, but winter whispers in my ear. Maple trees turn neon yellow and orange, oaks a deep red. Last Saturday was one such gorgeous autumn day in central Illinois. We piled into the SUV with my grandson and headed for Champaign, IL. 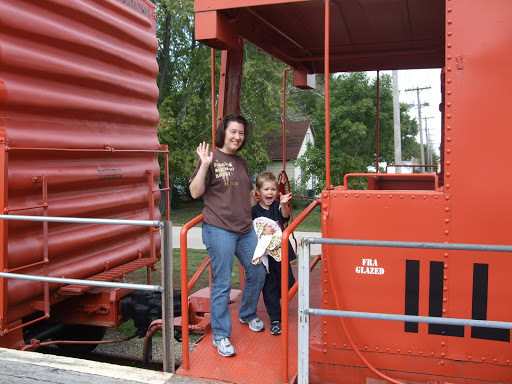 Our first stop was the Paxton train museum where the old volunteer enthralled four-year-old, Sean, and we adults with train stories and a tour of a caboose. After an hour of trains, we continued south to Curtis Apple Orchard, a autumn tradition popular with U of I students and their parents. Admission is free, but the Curtis family covers the cost of the displays and entertainment by charging more than grocery store prices for apples and pumpkins. It’s worth it. Sean loved the many children’s activities and I loved watching him play. 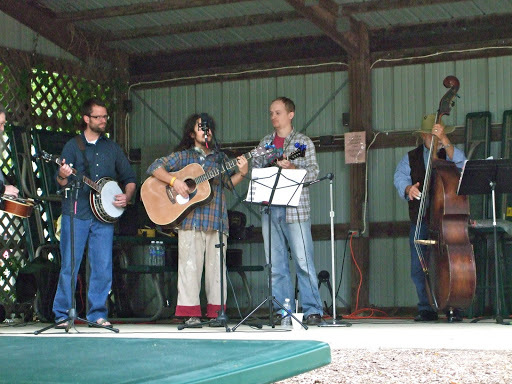 While he munched on apple donuts and apple juice, we listened to blue grass ballads, complete with banjo and bass fiddle. Sean picked his perfect pumpkins and we headed home. – When beef is browned, saute onion and green pepper until soft. – Stir to prevent sticking, rotate pot to prevent hot spots. Use new coals, if needed. – When mixture boils add pasta, and return to coals for 8-10 minutes, rotating pot. – Stir to prevent sticking. mixture. Do not stir in. Cover pot. – Return to coals and place addtional coals on top of pot lid to create even heat. – Bake for about 15 minutes; or more depending upon heat of coals and surrounding fire. The secret ingredients are the smokey flavor. . . and a gorgeous autumn day. Enjoy.